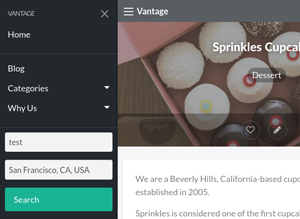 A new version of the popular Vantage AppTheme is now available. In this new version 4.2.0 our lead developers have addressed a couple of minor issues brought to our attention and have implemented some exciting new features. In the latest version of the Vantage AppTheme our users can rest assured that their mobile users will not face the ‘Near Field’ disappearing. Thisissue was brought to our attention and addressed by the development team. The example screenshot below demonstrates the two fields that your mobile users should be able to see on your website when using the latest version of Vantage. The greatest addition to this latest version of Vantage is the AppThemes AppMaps module. You can read about this and a handful of other new features below. Vantage users can now take advantage of the AppMaps Module that allows alternatives to the Google Maps API that comes as standard. Both the AppMaps Bing and AppMaps Mapquest can be used alongside Vantage to display different maps to those offered by the Google Maps platform. Our Vantage users can now locate their Map Settings by clicking on Admin > Vantage > Geo Services. The tabs presented to you when clicking on the Geo Services menu will be a direct result of the provider you are using. If you have any of the AppsMaps Marketplace Plugins, then your Geocoder and Maps providers drop-down will show multiple options. Your maps provider and Geocoding provider also have separate settings tabs allowing you to set different service providers and different API keys. Find out more on how to set up your Geo Services for Vantage Here. When a user on your site enters a location into the search form, the Address ‘Autosuggest’ feature of the AppMaps module is triggered. This feature can now use other services, for example, “Bing Autosuggest API” or “Mapquest Place Search API”, not only the “Google Place Search API”. This allows your visitors to quickly search for something in their required location. If the ‘Default Radius’ option is empty, location search will calculate radius depending on search request. For example, search by country will cover all of the country, not the standard 50 mi/km from the center. The fields “Find” and “Near” have been added to “Refine Results” widget and will appear on small screens. This allows your customers to easily locate the listing they are searching for (see screenshot below). When your users create a directory listing the “Address” field has got a map with a draggable marker, so now it’s possible to set location on the map instead of typing address (see below). You can use the following shortcode on your Vantage site to display the listings map. This can be used to display the map anywhere on your website as long as there is one listing on the page. When creating a directory listing as admin you can now add the address by marking the location on the map. This saves time as there is no need to type the address. How Can I Add the AppMap to a Page? Step 1) Locate the page that you wish to display a map on. This can be found by clicking on the ‘Pages‘ menu within a WordPress dashboard. Step 4) Click on the Update button. Step 5) Go to go to the front of your website and view the page where you have added the AppMaps. Note: To display the AppMaps you will need to have at least one listing on the page. Existing Geodata in postmeta table is still there for backward compatibility. This means that if you are a customer you can freely downgrade Vantage to 4.1.6 without any issues. It’s backward compatible. If you are using plugins that relate to maps make sure that they are already updated according to new AppMaps API. 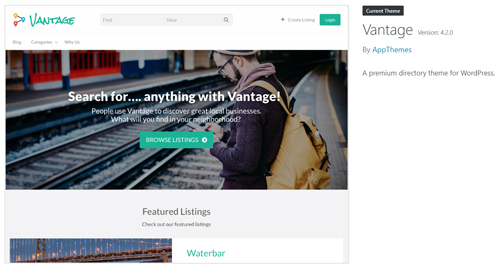 Customers who currently own the Vantage AppTheme can simply update to the latest version. If you run a high traffic site we always recommend viewing the change log prior to clicking the update button. All deprecated functions, classes, hooks, options and libs are also outlined in the change log. We hope our users enjoy the new and flexible Geo Location features of Vantage 4.2.0! Find out how to Upgrade to Vantage 4.2.0 Here.